The most ubiquitous, unnoticeable devices nowadays are chargers. With the average Joe carrying at least two or three rechargeable electronic devices on their person every day, chargers are in abundance everywhere and go without a second glance. The new Lawmate WiFi Power Adapter Spy Camera/DVR takes advantage of this fact to provide you with one of our most covert, useful cameras yet! Built-in Wifi. With the built-in wifi you'll be able to access your high definition 1080p video stream from anywhere. You can control, view, and transfer video all from your smartphone using the free downloadable app. Worry free battery life. Since the Lawmate WiFi Power Adapter Spy Camera/DVR plugs into the wall you'll never have to worry about the battery running out in the middle of your recording. As long as the device is plugged in it will be powered and running. Included MicroSD card. The Lawmate WiFi Power Adapter Spy Camera/DVR comes with an included free 16 GB microSD card, so you'll be ready to start recording video straight out of the box. 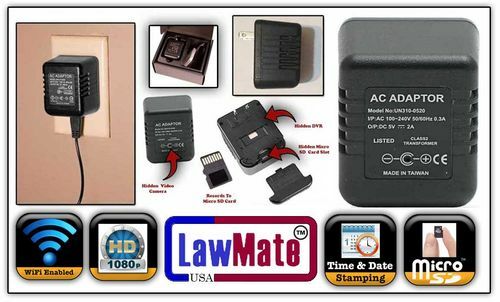 Get a Lawmate WiFi Power Adapter Spy Camera/DVR today and keep your home safe!